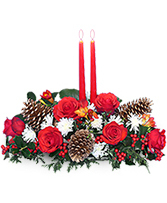 Plastic Utility Container, Wet Floral Foam, Red Taper Candles, Foliage: Salal, Seasonal Evergreens, Red Roses, Red Freesia, White Snowflake Poms, Holly With Berries, Gold Pine Cones On Wired Picks. 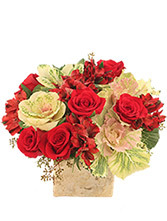 Square Birch Bark Pot With Liner, Wet Floral Foam, Foliage: Seeded Eucalyptus, Small Kale, Red Roses, Red Alstroemeria. The garden is blooming brightly this winter season with vibrant red roses and alstroemeria. 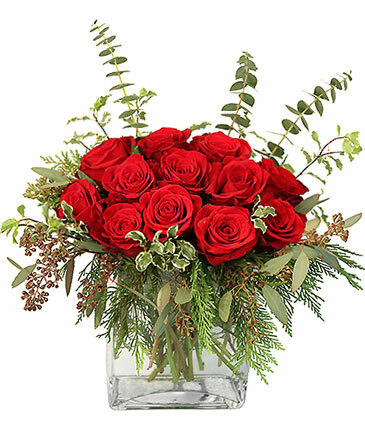 Ring in the Christmas season and bring a part of nature home with a sweetly scented bouquet.